Due North Everyday G-3 Ice Cleats. Due North® designed the Everyday G-3 Traction Aids to be even more functional and easy to use than the Everyday. The versatile Everyday G-3 Traction Aids are ideal for outdoor winter activities that require urban and light-duty casual, dress and athletic footwear. 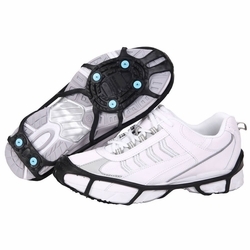 Whether you're shoveling the sidewalk, walking the dog or just running errands, the lightweight yet durable design of these Traction Aids will give you the confidence you need when walking or running on icy and snowy conditions. With all the same features as the Due North® Everyday Traction Aid, the Everyday G-3 Traction Aid is designed with an enhanced shape that allows it to more easily adapt to the shape of your shoe to provide a more secure fit. Its tungsten carbide Ice Diamond™ Spikes, which are 10x stronger than steel, provide increased traction that help with preventing slips and falls on ice and snow, which will help reduce the risk of pulled muscles, fractured bones or even back problems caused by a quick slip or fall. When not in use, the compact design makes them easy to store in small places such as, your coat pocket, handbag, briefcase or the glove box in your work vehicle. Due North brand ice cleats are manufactured by Sure Foot Corporation. SHOES NOT INCLUDED. NOT DESIGNED FOR TECHNICAL CLIMBING. Preformed molded construction for better fit, ease of putting on and increased comfort. Solid traction pad prevents snow/ice build-up between traction aid and footwear. Textured lining helps to prevent movement and slipping on sole of shoe/boot. Enclosed toe area for secure fit. 6 Tungsten Carbide Due North® Ice Diamond™ Spikes are integrated into a proprietary rubber tread design for improved traction. *Note: If you are in between sizes, or if you are using this product on oversized winter footwear or boots, we recommend that you go up one size.